Photo of Mildred "Millie" Osman that appeared in a 2005-06 Photo Directory of Port Royal Methodist Church members. (The photos were taken by Olan Mills Studios.). 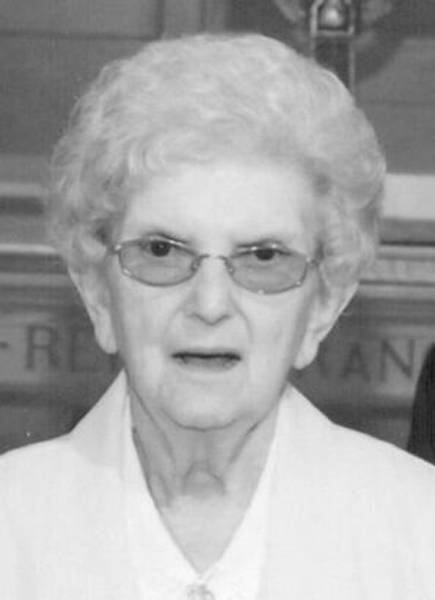 Mildred L. "Millie" Osman, 83, of Port Royal, passed away at 7:50 p.m., Wednesday, March 18, 2015, at the Geisinger-Lewistown Hospital. Born on April 22, 1931, in Locust Run, Juniata County, she was the daughter of the late Robert R. and Veda (Partner) Slagle. Her husband, Ralph W. Osman, preceded her in death on May 10, 1999. Surviving are a son, Robert A. Osman and wife, Vicki, of Lewistown, a granddaughter, Rebecca Osman, of Lewistown, a grandson, Anthony Osman and wife, Chelsea, of McVeytown, and seven great-grandchildren. Millie was a retired seamstress, having worked for the former Ral-Sel Corp., Port Royal, and the former Lyon's Fashions, of Mifflintown. She was a member of the Port Royal United Methodist Church. Her funeral service will be held at 11 a.m., Monday, March 23, 2015, at the Rex Funeral Home in Port Royal with Pastor Terry J. Brosius officiating. Burial will follow the service in the Old Church Hill Cemetery. A viewing will be held on Sunday evening, March 22, from 7 to 9 p.m. at the funeral home. Photo of Millie that accompanied her obituary in the Lewistown Sentinel.